Information Fusion, 38 , pp. 12 - 21, 2017, ISSN: 1566-2535. Throughout the years having knowledge of Web users’ interests, navigational actions and preferences has gained importance due to the objectives of organizations and companies. Traditionally this field has been studied from the Web Mining perspective, particularly through the Web Usage Mining (WUM) concept, which consists of the application of machine learning techniques over data originated in the Web (Web data) for automatic extraction of behavioral patterns from Web users. WUM makes use of data sources that approximate users’ behavior, such as weblogs or clickstreams among others; however these sources imply a considerable degree of subjectivity to interpret. For that reason, the application of biometric tools with the possibility of measuring actual responses to the stimuli presented via websites has become of interest in this field. 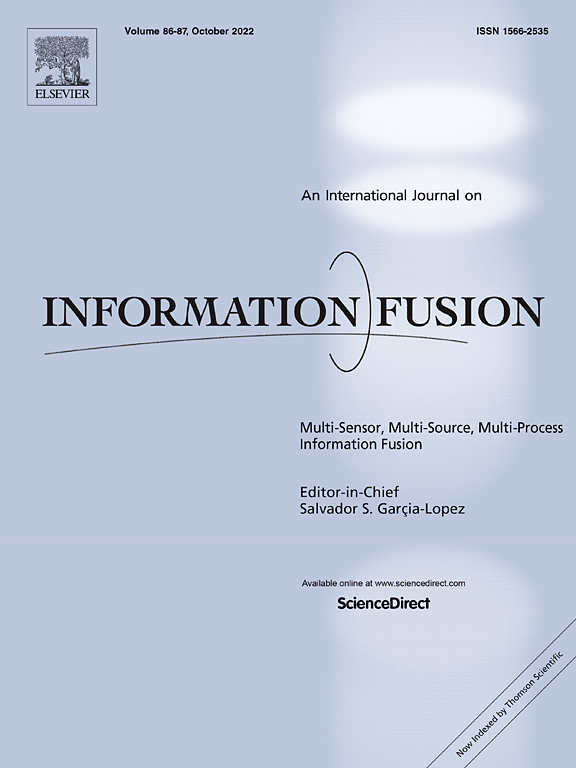 Instead of doing separate analyses, information fusion (IF) tries to improve results by developing efficient methods for transforming information from different sources into a single representation, which then could be used to guide biometric data fusion to complement the traditional WUM studies and obtain better results. This paper presents a survey of Biometric IF applied to the WUM field, by first defining WUM and its main applications, later explaining how the Biometric IF could be applied and finally reviewing several studies that apply this concept to WUM. Engineering Applications of Artificial Intelligence, 64 , pp. 261 - 271, 2017, ISSN: 0952-1976. Plagiarism refers to the appropriation of someone else’s ideas and expression. Its ubiquity makes it necessary to counter it, and invites the development of commercial systems to do so. In this document we introduce Docode 5, a system for plagiarism detection that can perform analyses on the World Wide Web and on user-defined collections, and can be used as a decision support system. Our contribution in this document is to present this system in all its range of components, from the algorithms used in it to the user interfaces, and the issues with deployment on a commercial scale at an algorithmic and architectural level. We ran performance tests on the plagiarism detection algorithm showing an acceptable performance from an academic and commercial point of view, and load tests on the deployed system, showing that we can benefit from a distributed deployment. With this, we conclude we can adapt algorithms made for small-scale plagiarism detection to a commercial-scale system. Information Fusion, 35 , pp. 51 - 57, 2017, ISSN: 1566-2535. In this paper a novel approach for analyzing web user behavior and preferences on a web site is introduced, consisting of a physiological-based analysis for the assessment of a web users’ click intention, by merging pupil dilation and electroencephalogram (EEG) responses. First, we conducted an empirical study using five real web sites from which the gaze position, pupil dilation and EEG of 21 human subjects were recorded while performing diverse information foraging tasks. We found the existence of a statistical differentiation between choice and not-choice pupil dilation curves, specifically that fixations corresponding to clicks had greater pupil size than fixations without a click. Then 7 classification models were proposed using 15 out of 789 pupil dilation and EEG features obtained from a Random Lasso feature selection process. Although good results were obtained for Accuracy (71,09% using Logistic Regression), the results for Precision, Recall and F-Measure remained low, which indicates that the behaviour we were studying was not well classified. The above results show that it is possible to create a classifier for web user click intention behaviour based on merging features extracted from pupil dilation and EEG responses. However we conclude that it is necessary to use better quality instruments for capturing the data. Journal of Biomedical Informatics, 74 , pp. 71 - 84, 2017, ISSN: 1532-0464. Information Fusion, 27 (0), pp. 64 - 75, 2016, ISSN: 1566-2535. Abstract Plagiarism refers to the act of presenting external words, thoughts, or ideas as ones own, without providing references to the sources from which they were taken. The exponential growth of different digital document sources available on the Web has facilitated the spread of this practice, making the accurate detection of it a crucial task for educational institutions. In this article, we present DOCODE 3.0, a Web system for educational institutions that performs automatic analysis of large quantities of digital documents in relation to their degree of originality. Since plagiarism is a complex problem, frequently tackled at different levels, our system applies algorithms in order to perform an information fusion process from multi data source to all these levels. These algorithms have been successfully tested in the scientific community in solving tasks like the identification of plagiarized passages and the retrieval of source candidates from the Web, among other multi data sources as digital libraries, and have proven to be very effective. We integrate these algorithms into a multi-tier, robust and scalable JEE architecture, allowing many different types of clients with different requirements to consume our services. For users, DOCODE produces a number of visualizations and reports from the different outputs to let teachers and professors gain insights on the originality of the documents they review, allowing them to discover, understand and handle possible plagiarism cases and making it easier and much faster to analyze a vast number of documents. Our experience here is so far focused on the Chilean situation and the Spanish language, offering solutions to Chilean educational institutions in any of their preferred Virtual Learning Environments. However, DOCODE can easily be adapted to increase language coverage. Information Fusion, 27 (0), pp. 95 - 110, 2016, ISSN: 1566-2535. Abstract Interest in Opinion Mining has been growing steadily in the last years, mainly because of its great number of applications and the scientific challenge it poses. Accordingly, the resources and techniques to help tackle the problem are many, and most of the latest work fuses them at some stage of the process. However, this combination is usually executed without following any defined guidelines and overlooking the possibility of replicating and improving it, hence the need for a deeper understanding of the fusion process becomes apparent. Information Fusion is the field charged with researching efficient methods for transforming information from different sources into a single coherent representation, and therefore can be used to guide fusion processes in Opinion Mining. In this paper we present a survey on Information Fusion applied to Opinion Mining. We first define Opinion Mining and describe its most fundamental aspects, later explain Information Fusion and finally review several Opinion Mining studies that rely at some point on the fusion of information. políticas de drogas en el país. Neurocomputing, 168 , pp. 179 - 189, 2015, ISSN: 0925-2312. Se propone un nuevo enfoque para predecir la intención de click del usuario Web, usando datos de dilatación pupilar generados por un dispositivo de eye-tracking. El objetivo es determinar si esta variable permite diferenciar estados de elección y no-elección de objetos Web, y de ser así, generar un modelo de clasificación para predecir la elección entendida como un click. Para esto, se realizó un experimento con 25 sujetos saludables, en que la posición ocular y la dilatación pupilar fue capturada mientras los sujetos realizaban tareas de elección entre diferentes objetos en un sitio Web simulado. Los resultados del análisis muestran que existe una diferencia significativa entre los tamaños de la pupila para los objetos escogidos frente a los no escogidos. Además, se creó un modelo de predicción de intención de click, basado en Redes Neuronales Artificiales, que obtuvo un 82% de accuracy. Estos resultados sugieren que esta variable puede ser usada en la perspectiva de Web Intelligence como una aproximación del comportamiento del usuario Web, para generar un sistema de recomendaciones para mejorar la estructura y contenidos de sitios Web. Expert Systems with Applications, 41 (4, Part 2), pp. 1593 – 1600, 2014, ISSN: 0957-4174. Delivery of efficient service through a web site makes it compulsory in the redesigning stage to take into account the behavior of the users, which can be studied by means of a web log file that partially records information about user visits. The reconstruction of all of the sequences of pages that are visited by users who browse a web site is known as the web sessionization problem, and it has been formulated by means of an integer programming model; however, because a web log can accumulate a large amount of information, it is necessary to reconstruct the sessions over a period of weeks or months, thus the solution to this problem requires a long computational processing time. This paper presents a heuristic approach based on simulated annealing for the sessionization problem. Using this approach, it has been possible to reduce the processing time up to 166 times compared to the time that is required for the integer programming model. Furthermore, the metaheuristic solution finds new optimum values, which achieve increases on the order of 17% in the best cases. Neurocomputing, 131 (0), pp. 300 - 311, 2014, ISSN: 0925-2312. Intelligent Data Analysis, 18 (1), pp. 43-61, 2014. Information Fusion, 20 (0), pp. 129 - 135, 2014, ISSN: 1566-2535. Expert Systems with Applications, 41 (17), pp. 7764-7775, 2014. Engineering Applications of Artificial Intelligence, 35 , pp. 187-198, 2014. Revista de Ingeniería de Sistemas, pp. 87-107, 2014. Expert Systems with Applications, 40 (9), pp. 3756-3763, 2013. Engineering Applications of Artificial Intelligence, 26 , pp. 1469 - 1478, 2013, ISSN: 0952-1976. Expert Systems with Applications, 40 (5), pp. 1427 - 1436, 2013, ISSN: 0957-4174.